Before I get started on this review, I want to apologize to all of you about how long it took me to write this. As you all know I’m a huge Metal Gear Solid fan. 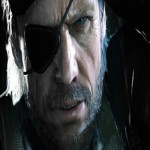 Even with all the problems that have come from Konami in recent months, and with my disgust of them selling Ground Zeroes, a game that just turned into a paid demo, at such a high price, and even going as far as replacing the iconic David Hayter as the voice of Snake with Keifer Sutherland, I wanted to do everything I can to give The Phantom Pain a fair chance. Now this looks pretty darn cool, one of many interesting locations you will visit in The Phantom Pain, with gorgeous graphics. And yes, that includes going through the game as much as I can, which for all of the first main chapter of the game, clocked in at over 50 hours. But of course that includes playing through several of the side missions that I will discuss later. In addition, I had to endure through several critical bugs that were uncovered. The worst of which came in the form of a control freezing bug that also included a sound stuttering issue, similar to the one I experienced with The Witcher 3 (although that bug didn’t affect the control.) However, as the PlayStation 4 and PC versions of the game were supposedly patched to resolve this issue, there was no sign of a patch for the Xbox One version which I reviewed. I waited as long as I could for Konami to release a patch to fix this problem, but since they haven’t released a patch, I decided I waited too long to write this review, so I’m going to let you know what I think of Metal Gear Solid V: The Phantom Pain. And let me start by saying, despite this bug and several other issues I had with the game, I will say that it more than makes up for the disappointment that was Ground Zeroes. Is it the perfect 10 that I’ve seen other reviewers claim it to be? No, not at all. 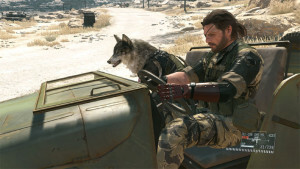 But it is one of the better games to come out this year, and a great swan song to Hideo Kojima’s tenure at Konami. Talk about a cool ride into battle! 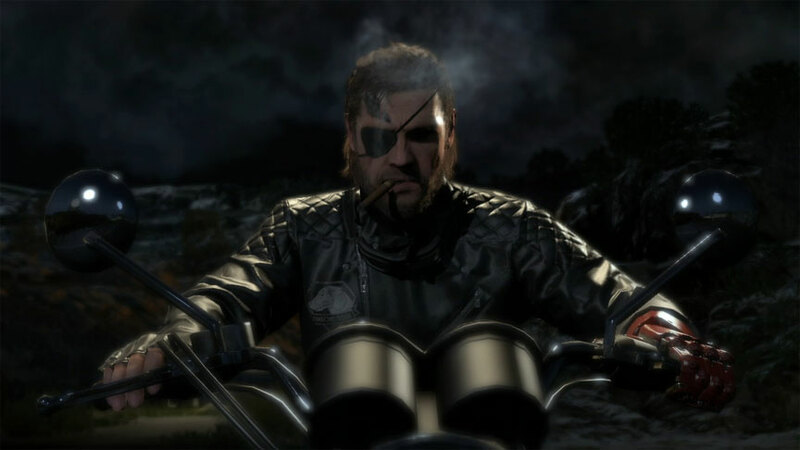 This quest for revenge extends further into the MGS universe, where we eventually meet up with characters that will eventually become huge factors in the “Outer Heaven” and “Les Enfant Terribles” storylines. Fans of MGS will catch on them almost instantly. Hangin’ out with the boys, kind of. 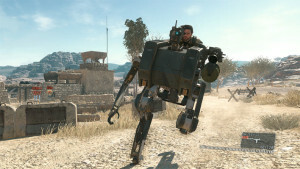 As for the game itself, it feels closest to MGS Peace Walker, as it generally is a sequel to that game. However unlike Peace Walker which consisted of several closed areas connected by pathways, Phantom Pain is completely open world. Taking place in both Afghanistan and the Angola/Zaire region of Africa, both settings are open playgrounds for Snake to explore. Missions are cut into either the main campaign, which progresses the story above, or as side missions. These missions consist of extracting prisoners or soldiers (some of which will be necessary as they provide special features, such as being able to translate other languages needed for interrogation,) destroying equipment, hunting animals, even doing menial tasks such as mine clearing. 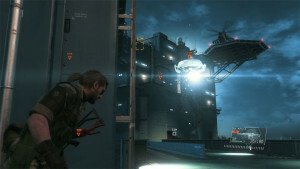 In addition, capturing these prisoners and soldiers will also help in rebuilding Mother Base. 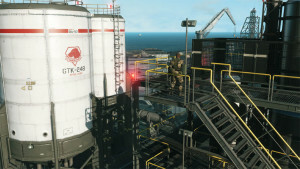 Located in the Seychelles, the new Mother Base will build up as much as you collect soldiers and prisoners to add to your army. 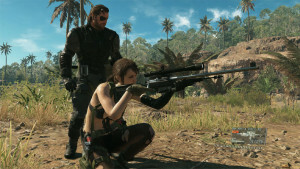 With doing so, facilities based on combat, intel, support, R&D, medical, and several others unlocked in the main campaign will be built up to help Snake out in the field. The view from up here is really great, all the better to snipe from. In addition, combat teams can be dispatched to do their own missions. 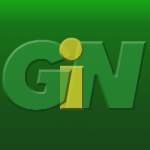 Based on the success of said missions, additional forms of revenue and material procurement will be made available. While Mother Base is your primary base of operations, several other “Forward Operating Bases” (FOBs) can be built. These bases use a form of currency called MB coins. Enough coins are granted to build your first FOB, but more must be purchased via microtransactions. I will say however that you really do not need to do this, as I’ve been more than sufficient with the single FOB. 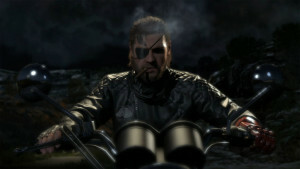 The main storyline is pretty accessible for those who are used to playing recent Metal Gear Solid games, but I will mention right now, XOF’s elite “Skulls” unit is a pain to deal with, especially in one mission, where you have to siege a special convoy before it gets offloaded to a dock. Not only do you have to recover the cargo, but it also triggers the Skulls unit. 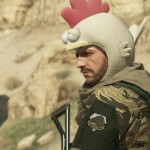 This mission did require me to use what has been called the “chicken hat” in order to complete it. Thankfully that was the only time as for the most part the challenge is just right. 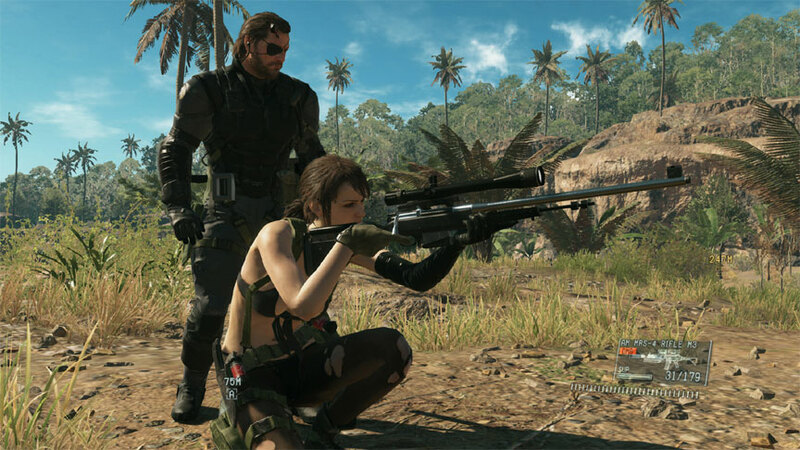 With all the available missions in the game, as well as the building/expansion of Mother Base and the upcoming Metal Gear Online, this game could easily last hundreds of hours, a far cry from Ground Zeroes, and as such is highly recommended. Okay, when I jump out, you take the wheel, got it? However there are some issues, in addition to the bugs that prevent the game from being perfect. For one, most of the side missions can get to be old hat after a while. In addition, while I developed a technique for collecting soldiers (which I like to call “trank and bank,”) it ended up getting many soldiers whose skill levels are so weak that they end up being released. Thankfully though, when it comes to my “trank and bank” strategy, soldiers actually adapted to it, going as far as wearing body armor and helmets to make only face shots effective. They even go as far as shooting down my recovery balloons the moment I use them. I learned to counter them by doing special “sabotage” deployment missions that prohibit the armor supplies, so it ends up being a nice little game of cat and mouse. Vehicles are another disappointing issue. When you begin your campaign in Afghanistan you get your first “buddy,” a horse named appropriately, D-Horse. He quickly becomes your go to buddy for the first part of the game (though another Walker character will assist as well) and while not as drunk in his movements as Roach from Witcher 3, he can still be somewhat clumsy to use. But still using him pretty much makes vehicles useless. They might only become more efficient after acquiring another “buddy” that I used more often, a husky named D-Dog but still I favored travelling by foot. Visually this game is gorgeous. The Xbox One version’s resolution was increased to 900p, but what matters more is the frame rate is a near constant 60 frames per second. Yes there were some slowdown moments but for the most part it runs great. 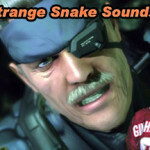 Don’t worry, Snake is still Snake, even with a different voice actor. Same for the audio. Let’s get this out of the way right now. 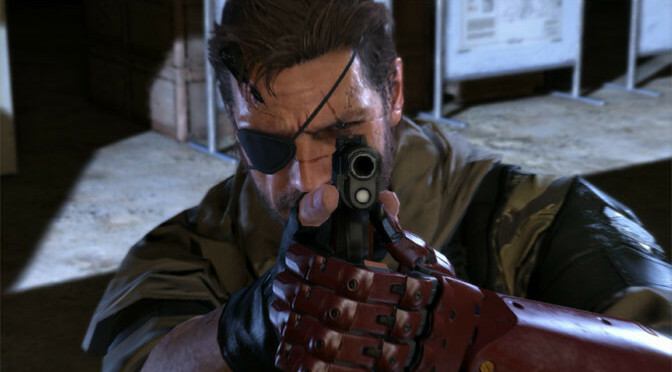 I know I’ve been very critical of Keifer Sutherland replacing David Hayter in the past, but I will admit his voice does work. It might not have the same emotional range that Hayter provided in years past but it gives me the impression that Snake has lost his sense of emotion since over the years. The rest of the voice acting is top notch, especially Troy Baker as Ocelot. He actually made my favorite character in the series even better than before, and while I’m still trying to figure out his affiliations, Baker makes it much better. The soundtrack even has a good collection of classic 1980s songs. However, I have some questions regarding the selection. One of the songs included in the game was “The Final Countdown” by Europe, a song that was released in 1986. Considering that Phantom Pain takes place in 1984, was this done as an oversight, or did Kojima put this in intentionally, as a way to lampoon the “Time Paradox” endings from MGS 3? Always good to tuck your tail between your legs when running away. But I’m going too far on a tangent. 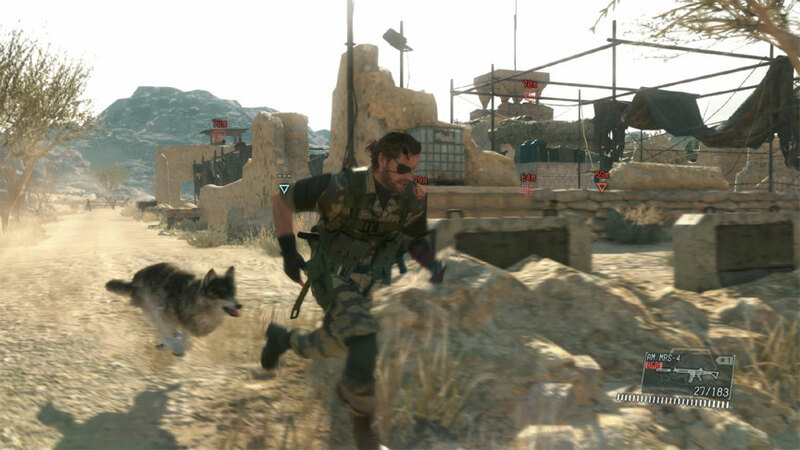 Phantom Pain is a great game, and to an extent it kinda makes me understand why Ground Zeroes was released as it was. It was truly a demo of what the greatness that the full game shown, particularly the open world environment. Konami should not have charged as much for it as they did. However, the value for Phantom Pain is just right, and no you don’t need to worry about the microtransactions. They do not affect the overall experience at all. Even better with Metal Gear Online being available by the time this is published, you have no excuse to not play it as much as I have, or even more! Cons: Side missions can get to be repetitive. Some irritating bugs, which on the Xbox One, still have to be fixed at the time of this review. Some of the licensed tracks suffer a time paradox (Final Countdown in particular.) One insanely frustrating episode almost ruined the experience for me. Vehicles aren’t really that useful compared to riding D-Horse.